Hey guys, this post might only apply to BA/MA photo students but I want to make it about my shift to an (almost) entirely paperless workflow for my assignments. Yup, probably the single most interesting blog post you’ll ever read, ever. A few of you already know about what I’m doing now and are trying it for yourselves but for those that wanted to know more, I’m currently using Evernote! 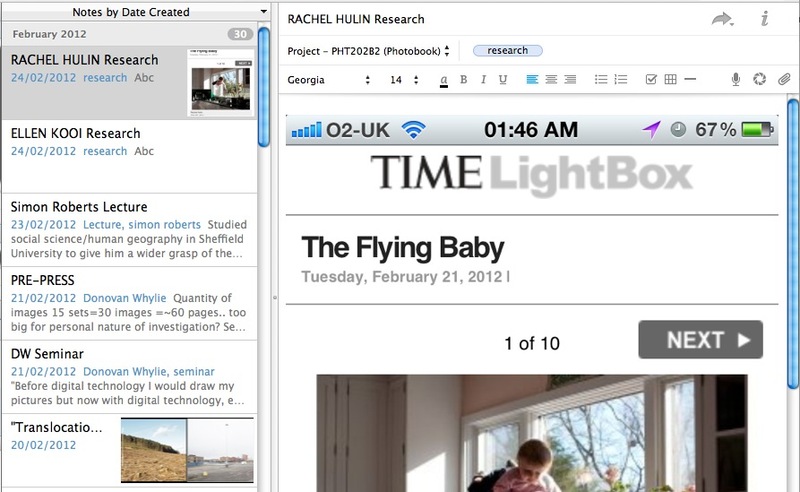 Evernote is a cloud-based note taking and archiving tool. It’s basically a faster, more efficient, less vulnerable and far smarter tool than your standard issue Daler Rowney or moleskine sketchbook. My problem before going paperless was simply time and motivation. For our photo projects in uni we have to keep a project journal (or ‘Research and Development Book’ as they call it) which involved a lot of hoarding, printing and sticking and handwriting in a sketchbook/moleskine/folder/whatever was at hand. From contextual research materials to production plans to lecture/tutorial notes and my own thoughts as they developed- there was basically a lot of time spent documenting and organising my work instead of actually working. On more demanding projects I found myself abandoning my conventional RDB simply because it was getting in the way. Ultimately the RDBs, to me at least, existed just so that the tutors at uni would have something tactile to grade. However they always insisted that these books became part of our workflow, a means to take things out of our head and onto paper so we could bring some sense to them or, at least, remember them later. So, with that in mind I tried all manner of paper notebooks and sketchbooks, from tiny little A5 books to post-it arrangements on my walls but in the end I just couldn’t keep up with my thought process. Before joining the dots towards Evernote I blew through a few other solutions, none of these are terrible setups but for what I was doing, Evernote beat the crap out of them. A beautifully designed program by the people at Behance. It is a very powerful project management tool but it didn’t quite fit for what I wanted to do. In my opinion it would be best suited for creative teams trying to pull together a project as it is very action-based (yea, I know..). It has a great delegation system which would work beautifully in a creative team/classroom (I definitely think this could be used in secondary education) but didn’t really offer the sort of flexibility I was looking for- writing longer streams of thought or something purely archival. That, and you have to pay to get the better features. You probably already know about Tumblr. Basically it’s a micro-blogging platform. Great for simple inspiration hoarding and stream-of-consciousness writing but as far as being a system for managing a project, it lacked the organisational power of dedicated programs. Plus it was all online; no real offline app to work with on the move. I knew this wasn’t really going to work but the idea that I could potentially print out all my work at the end and bind it as a book for hand-in made Google Docs and Pages attractive. This system is much like a fully paper based one as you write each page sequentially in a word document (like pages in a notebook) but you can take advantage of cloud storage with Google Docs (so you can access your ‘book’ anywhere) and you have the speed of typing and attaching image files (rather than writing and cutting/sticking). However I found it quite messy and not terribly efficient, with consistency issues using Google Docs and just the general feeling of writing in a word document format not being the most fun experience in the world, it wasn’t worth the printing advantage. I had an Evernote account around the same time I started using the Action Method but I couldn’t really find a use for it until I started really figuring out what I could do with it. Rather than bore you with stuff you can easily find on their site I will share my own setup. So, first up, I have three points of access to the program: my macbook, my iPhone 4 and any computer with an internet connection and a web browser. Because all of the information is stored in the cloud, it doesn’t matter if my house burns down and I drop my iphone in the ocean and all the computers in UUB burned out, all at the same time, the work is still safe. This doesn’t just solve the problem of losing your paper-based journal during the last weeks before your final deadline, it also means you can keep working when a paper-based system would otherwise let you down because you now don’t need to have that one physical book with you everywhere you go. 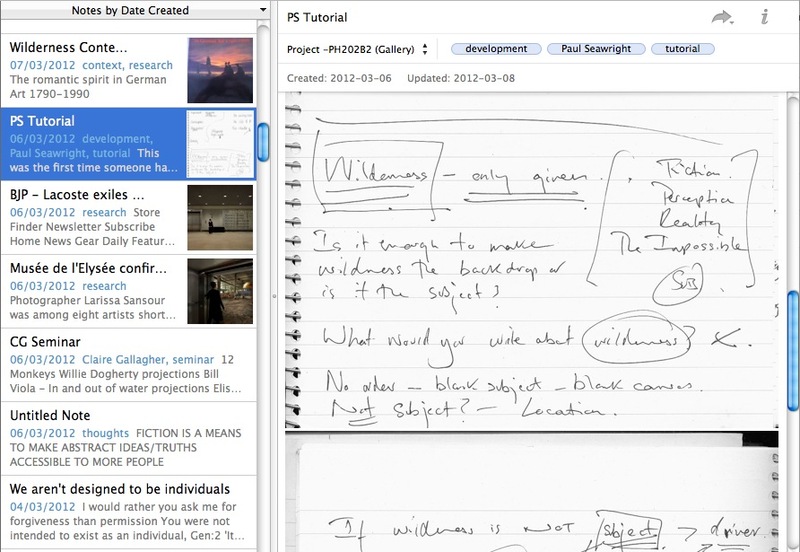 Evernote allows you to group notes into notebooks, just like you would organise paper journals. For me I have one notebook for every project and then a few more for other personal things, ideas, blog posts, trips etc. You can also stack notebooks like you would split a paper journal into sections. In this case I have my international plans for this/next year split into an interrail trip I want to do during the summer and my Erasmus programme research for next year. I should probably stack all my uni-related notebooks by year but you get the idea. This simple little feature is a far cry from the days I would have 3 different moleskines in my bag just to keep track of stuff. For each note you can very easily add labels to keep things together in the present and searchable in the future. Labels work autonomously from notebooks so, for instance, I can stick the label ‘Donovan Whylie’ on all of Donovan’s lectures, seminars and one-one tutorials accross multiple projects. This not only lets me pull up what he said to me about x, y and z while I’m still working on a project but it also lets me look back on everything he said in 5, 10, 30 year’s time. I do the same for visiting lecturers, crucial points in my personal development, research I have done on the same artist accross multiple projects (think using essay research in your practical project book, only without the pointless duplication for the sake of marking). Labels are another very simple yet incredibly powerful tool that had me sold. I have a stack of moleskines from first year that sit on my shelf now that are a nightmare to try and look back and find things in. Lables solve that problem entirely. A big problem I had with paper journals was the amount of saving, printing, cutting and pasting you had to do to keep a record of stuff. Often I found that if I saw an image (or some text) I wanted to make part of my research in a book I liked I would have to scan or photograph it into a digital format just to print it back onto paper again to stick into another paper book. Now if a book is mentioned in a lecture, I make a note, title it with the books name and either pull it up on Amazon for purchase or Google Books on the fly to read later. Further still, I can go to the library with my iphone, find the book and photograph the spreads, images or parts of an essay I want to keep and write about later. I can make some quick thoughts there and then in the same note the images are being attached to on my iphone or later on my mac if I want to write at length. Thanks to the cloud storage feature the images are uploaded immediately (if you have Wifi or 3/4g) and are ready for you when you go to your computer to write properly. This same ease comes with the likes of when, say one of my tutors emails me an article in the Times about something relevant to my work. Instead of waiting until I’m home so I can print out a screenshot or excerpt of the article/image/whatever I can just screenshot the content directly on my iphone and drop the image into a note with some thoughts on it if need be. All saved and synched without touching a sheet of paper. Now I’m not a die-hard advocate of digital solutions, there are some things you just can’t beat about loosely sketching down concepts or thoughts on a sheet of paper. You could say that the graphics tablet could fix that but it’s just not quite the same (yet). Though I’ve found that keeping my more formal research and writing away from my loose ideas has helped me take my physical ‘RDB’ much less seriously, in fact it is more of an ideas book now, with no structure or organisation and instead complete freedom with what I do with it. It lets me make a mess and tear out pages and just get stuff down on paper regardless of how easy it is to grade by the tutors (more motivation, less expectation). That’s were Evernote comes in. Once I’ve got an idea down or a sketch for an image i can add it to my digital, organised journal in the same way I can with books in the library, I photograph the sketch (or scan it if it’s detailed/important), drop it in a note and expand on it if need be with some words to help the tutors understand what’s going on. I still keep my original paper version in the ideas book just for keeps sake. I find that way it gives you two spaces to work in, one that’s organised and usable in a commercial or educational setting and another which has no expectations and complete freedom to just get stuff out of your head. That being said, if i had an iPad, touch surface manufacturers started incorporating a paper-like texture, a Wacom ipad stylus and the Bamboo Paper app (which can save sketches to Evernote seamlessly) I might reconsider. If you’re working with a group of people and have multiple people contributing notes you can all share a notebook and everyone can make use of the Author field in the note’s properties. This can be for something as simple as organising a birthday party, writing a collaborative book/essay to organising a wedding or managing a larger commercial production with multiple people contributing multiple resources (photographer contributes equipment expenses, scout contributes possible location, producer contributes logistics updates and documents, AD contributes mood boards, stylist&HMU contribute possible look inspiration etc etc all in one place). Now one of the current problems with Evernote is that they don’t have a decent print dialogue, for my case with uni in particular I need to submit all this work but the sharing feature could potentially allow me to sidestep the the notion of printing out my ‘journal’ entirely. I know Donovan uses Evernote himself so I could easily just share my project notebook(s) with him/the rest of the staff, allowing them to not only access the notebooks for marking but also have a live update on your work as it progresses. Of course if you scale this up to an entire class using Evernote it could easily clog up their notebook list (shown above) but that’s were stacking comes in (class year/student name/notebook/project name). To prevent students changing their work during marking the staff can download the student’s shared notebook as a static version which is not in the cloud and so can’t be changed. Digital .pdf versions of feedback forms could then be sent back to students’ shared notebooks there and then instead of printing them all out and distributing them by hand. If you make a new note during an event that is currently going on on iCal it will automatically guess the title of your note. Very handy for lectures and tutorials or client meetings, gigs, events etc. You can share notes with people who don’t have evernote, using the ‘copy share link to clipboard’ feature or by publishing directly to twitter or facebook from the app itself. You can geotag your notes. Find yourself on a backpacking trip or working internationally? Your GPS on your iphone/android device can stick a geotag on your work so you can keep track of what notes were made where. You can attatch URLs or whole documents to a note. I use this for keeping a backup of booklets or documents handed out by tutors but you could use it for travel documents, invoices, contracts, anything! No need to carry paperwork around if you can keep a digital copy in your pocket. If your device dies the documents are in the cloud, borrow a friends device if it has a web browser or find the nearest computer with an internet connection! There are thousands more little things you can do with this program, even some 3rd party apps which play seamlessly with Evernote to make your workflow really easy.